As my nail polish collection has grown, so has my need to figure out how the heck to store it all. As I have mentioned before, I love looking at my nail polishes. I have an entire collection of colors I love and I want them to be on display for the world (me) to see! These storage cubes are actually shoe boxes. I love that they are clear and you can see all the pretty things inside. You can check out the boxes here. Almost any plastic bins will do, just make sure that the bottom is FLAT otherwise nothing will stand up straight and it will drive you crazy. I am drooling over this one. I wish I had room for this shelf and all the nail polish to store on it. SO pretty! Can you believe this shelf is a DIY project?! I LOVE it. I need it. I am trying to convince my husband to make me one this weekend. 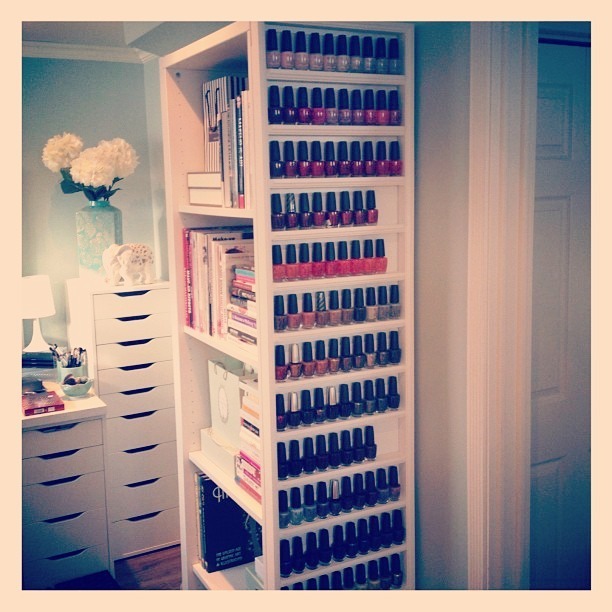 I am dreaming of the day I have the wall space for acrylic nail polish displays. If you have the wall space for these babies, you can snag them here. 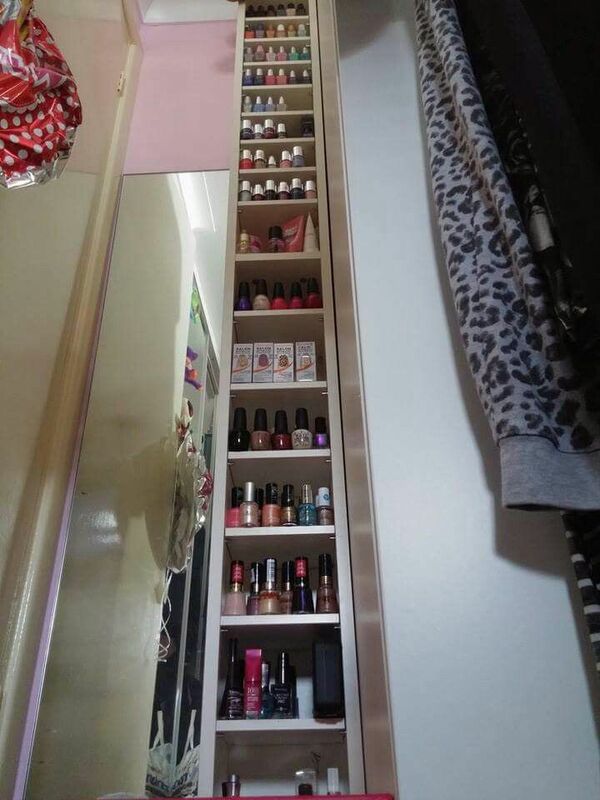 This is a great way to store if you want your nail polish to portable or not on display. You can buy the here. This storage option is serious. You won’t have to worry about your polish sliding around or falling down all over the place if you want to take it somewhere with you. It is all packed nicely in its own little spot. This is definitely not the most organized way to store your nail polish, but it would look so pretty on display on your vanity, it seems worth it. This is a cheap option, my favorite! You can buy these spice racks, unpainted, from IKEA for $3.99. Choose your own paint to customize, and done. This is another pretty display to store your nail polish. You could make this as big or as small as you need to store your polish and tools. 4 DIY Nail Polishes 3 Drugstore Acrylic Nail Kits 15 Nail Tape Manicures Are Sharpie Manicures Safe? This entry was posted in Beauty, DIY, Nail Art on February 5, 2013 by Heather. I use a lazy susan. Thanks so much for featuring my DIY nail polish shelf…I love these other ideas too! I love your DIY shelf! My husband is in the process of making me one right now! Thanks for reading! Another good and cheap idea I used to use for my girls. We would buy a large fish and tackle box that has those fold out shelves and some cute stickers. We would decorate the tackle box with the stickers, inside and out. The tackle box comes with dividers so you can do what you want with them. This can be used for a make up kit or a fingernail polish kit or both. That’s what I use! The polishes fit neatly in the little shelves, and larger things (remover, cotton, lotion, etc) all go in the bottom. There is even plenty of room for emery boards, buffers, orange sticks, q-tips, all the little implements that I need. I love that it shuts tight so if my 2 year old drags it out I don’t have manicure stuff scattered everywhere. The acrylic polish display from Amazon would fit inside the door under the bathroom sink. In number one what are the sticker things and where can I get them? Hey Gabby, thanks for reading! The stickers are actually labels that are painted with the polish, and then once it is dried you just use a hole punch to cut it out. That is ingenious! I have a huge collection of polish and they are all in a bag right now. I am trying to find a good idea to organize them. I am OCD to highest so having them all piled together is driving me nuts! Pingback: Nail Polish Storage - Painting Your Ikea Helmer | Nail That Accent! 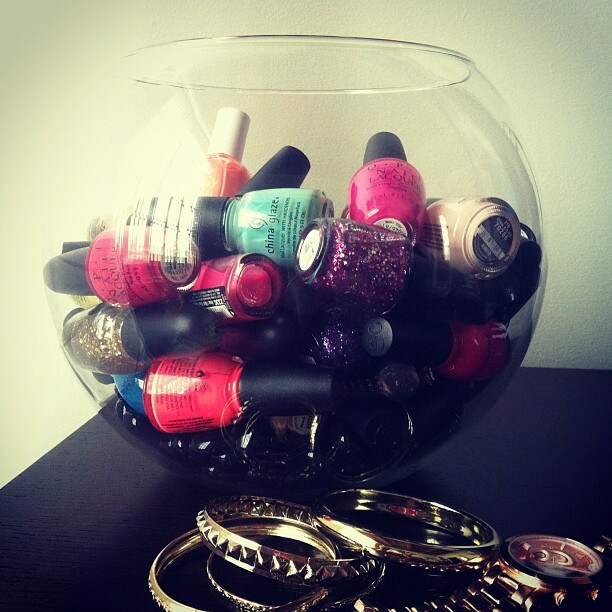 Love these ideas, all of my polishes are in a basket where I have to dig around to find them. The bookshelf idea and the ikea spice rack are my favorite. Gonna make sure the next time I visit ikea to implement that one for sure. Thanks for the great ideas,I think ill try the shelf one . My husband built me the shelf and I LOVE it! I love having all my polish on display, and it was pretty simple to make! Thanks for reading! Wow that are some pretty nice ideas! I especially love the one on the book shelf! Totally love it! Honesty these are all great ideas. However I wouldn’t recommend the magnetic storage because before my magnet didn’t stick well and I woke to to a neon pink nail polish stain on my rug! I use a cd storage shelving rack from ikea. If I knew how to post a picture I would! !